Sean Howard is the author of Local Calls (Cape Breton University Press, 2009) and Incitements (Gaspereau Press, 2011). His poetry has been published in numerous Canadian and international magazines, nominated for a Pushcart Prize in the US, and anthologized in The Best Canadian Poetry in English (Tightrope Books, 2011 & 2014). Sean lives in the lobster-fishing village of Main-à-Dieu, Nova Scotia, and is adjunct professor of political science at Cape Breton University. Rebecca Salazar: Congratulations on being named The Fiddlehead’s 2015 winner of the Ralph Gustafson poetry prize. 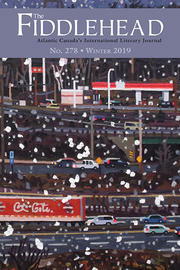 Your winning poem, “Cases (Unbound Poems, from Nova Scotia Reports),” juxtaposes what appear to be found fragments of domestic conflict reports to create a series of brief but emotionally packed scenes. Can you comment on the source material for this poem, and on how you went about writing it? Sean Howard: "Nova Scotia Reports" are, by their own definition, “a series of law reports designated by the Nova Scotia Barristers’ Society for the publishing of judgments of the Nova Scotia reports.” For some reason, dozens of volumes line the walls of the Faculty Lounge at Cape Breton University where I often go to meet colleagues or just read. The volumes always made me feel both curious and uneasy, and one day I decided to dive in and see what "pearls" of latent or unintended poetry I might find. I found a lot, using my usual, very simple method: reading down the page, the first word of every line, or just skimming the text, seeing what words light up. Conducting such rapid "raids" helps ambush, so to speak, the strict and dry legalese, flushing out hidden meanings and imagery. My aim was twofold: to evoke and distill the real human drama of the "cases" being so prosaically summarized, and to interrogate and invigorate – open out from inside – a language "encased" in its own professional certainties. RS: Some of your previous works, such as your collection Incitements, also operate by adapting or cutting out lines from other texts. What, to you, is the potential of “found poetry” as a genre or technique? SH: For me, the images and meanings I "find" by scrambling texts is, while often startling, only the starting point. I then try to amplify the new material, inspired by Carl Jung’s method of dream amplification, which can in turn generate new images and symbols. Every text, I believe (following William Burroughs), has an "unconscious," a range of implicit material the "surface" language often contradicts or attempts to repress. "Found poetry" in this expanded sense can be a literary variant of the return of the repressed in psychoanalysis. In this poem, however, almost all the twelve micro-sections are unamplified, taken directly from the text. This rarely happens, and I think can be explained by the intensity of emotions and experiences I was able to tap into. RS: “Cases…” is quite minimal, at times resembling haiku. I found overall that this allows the content to speak for itself, as opposed to being weighted with the melodrama or didacticism that can often accompany depictions of familial violence. Still, the poem unsettles traditional notions about family roles and values. What were the difficulties of approaching this topic in a poem? SH: (Haiku is a huge influence, so thank you!) I tried simply to listen to the unlocked language: to follow its powerful dream-logic. "Case #8804" reads: “youth: breaking, entering the world,” identifying the youth in question (or youth in general) as both a force capable of breaking into something and being broken by it. My method, and experience, I guess was rather similar: breaking into the text, and often being shattered by what I found. The poem only took a few intense sessions to write, but quite a while to recover from. RS: As a professor of political science, do you often find socio-political issues working their way into your poetry? If so, how do you negotiate this? SH: I should be clear I’m only an adjunct professor, able to dedicate most of my time to poetry. And yes, poetry is often for me an intersection of the personal and political. In recent years, for example, I have been engrossed in a major experimental project called The Shadowgraphs, no less than 150 "raids" (a few of which have been appeared in The Fiddlehead) into all Nobel Physics Lectures delivered in the 20th century (149 by men, by the way!). This crazy venture stemmed directly from my horrified interest in nuclear weapons and the Faustian science that brought us the Bomb and other horrors. And presently, to anticipate a later question, I’m working on a series of experimental responses to a book of Great War photography, at the same time I’m working with my wife, CBU Political Science professor Lee-Anne Broadhead, on academic papers (as well as collaborative poetry) related to the War. "Negotiating" this different modes of expression is sometimes difficult, for sure, though I hope the academic and creative approaches can enrich and inform each other. RS: More generally, how do you find that your teaching impacts your writing? How do you balance your academic work with your creative pursuits? SH: As stated, I’m not a full-time teacher or researcher, so the balance is (usually) fairly easy to maintain. (If I actually had a real job, God knows what would happen!) Interactions (and friendships) with faculty and students, though, are a frequent source of both insight and inspiration. RS: Do you have any poetic projects or manuscripts in the works right now? SH: There’s the World War One photography project, and some other pieces (published and not) which I think work well together. RS: What is your perspective on literary contests, or on their importance, either for writers, readers, magazines, or others? Has winning the Ralph Gustafson prize changed how you think about contests? SH: Contests are obviously important for magazines, both financially and in terms of profile and impact on the literary landscape. I’ve been fortunate to win three contests now (after many years of trying! ), and each success has been gratifying. (I also hope my success may encourage some other experimental poets to try their luck.) Last year, incidentally, I was a juror for the Governor-General’s Award for Poetry, a huge and entirely unexpected honour which gave me deep insight into the dangers and difficulties of judging! RS: Is there anything you’ve learned in your writing career that you wish you had known when you started out? What piece of advice would you give to new or emerging poets? SH: I can’t think of any piece that doesn’t sound condescending! Right from the start, by far the most important thing for me has been my belief and trust in the Presence Celan called "The Angel of Poetry." Of course, there are many practical considerations: putting the time in, responding intelligently (but not submissively) to criticism, dealing with inevitable rejections, reading like hell, drawing on your whole psyche (“Think with Thy Self,” as Shakespeare says), etc. But poetry doesn’t, fundamentally, come from – just flows through – the poet.